Faces of L’Arche Atlanta is a series of interviews where we highlight members of our community – Core Members, assistants, dedicated volunteers, and staff – so we can get to know each other better! We'll be introducing a new person each week, so make sure you are following us on Facebook and Instagram to be the first to see who we highlight each week! This summer Corbin made a L'Arche pineapple boat! Corbin is our newest Core Member, joining the L'Arche house the summer of 2016. Corbin brings the gift of music to our community (he's known as our resident bagpipe player, although he plays several other instruments! ), but he also brings the gifts of humor, a desire to learn new things, and a love for baking gluten-free treats. This week we got to sit down with him to hear about his L'Arche experience. I decided I wanted to live here because I have a nice bedroom and I like living here at L’Arche. I don’t remember when I first heard about L’Arche, but I came to dinner one time before I moved in. It was good! What is one of the silliest/happiest memories you have of L'Arche? I had fun hosting Porchfest this year. I loved having the popcorn and lemonade and getting to meet Laurie Ray. I want to host Porchfest again sometime! I also felt really good playing my bagpipes for everyone. I think when we host Porchfest again I want to introduce the performer! I had fun in Belfast last summer with Shae. It was cool to stay on a college campus at Queen’s University where it was held. I got to meet so many people--someone from New Zealand and I talked to Melanie from Jacksonville [L’Arche community leader from Jacksonville]. Some people were speaking different languages like French and Spanish, but it was still easy to talk to people. Corbin performed at the L'Arche International Assembly in Belfast, Northern Ireland in July 2017. L'Arche is all about forming "mutually transformative relationships." Can you share a time when you've experienced/witnessed true friendship while in community? I am friends with Grason because I play music with him and I like having a relationship with him. We like to listen to music and name some of the instruments we hear. What has been your favorite community event to attend? The best community event I’ve ever gone to was the Valentine’s dance. I liked the DJ and I liked the music that he played. Music is a big part of our household. Is there a song that makes you think of L'Arche or a specific person in the community? What are some of your favorite activities to do with community members? I like to eat with my housemates. I like going out to eat as a house--I had the most fun when we went to Taco Mac as a house and ate chicken wings! I loved going to the corn maze! I liked being able to walk around the maze. We also saw a potbellied pig! Corbin, thank you for bringing so much joy and fun to our community! We love you! Rita is not front and center, but she is a very important part of L'Arche! As our office manager, Rita does a lot behind the scenes that makes our community possible -- from planning community events, to making sure our assistants are supported, to thanking each donor for their contribution. Rita puts her full heart into L'Arche and it shows on a daily basis! This week we interviewed Rita to hear about how she first got involved with L'Arche (long before she was an employee!). At Sarah and Drew's wedding, everyone was welcome on the dance floor! One of my happiest memories—and a time I witnessed true friendship—was at Sarah Hine [one of our house assistants] and Drew Jacoby’s wedding. Our daughter Hannah came as my plus one and many from the L'Arche house were there as well. It was an outdoor wedding but the heavens burst open and it rained like mad! Despite the alternating light rain and downpours, everyone in attendance managed the weather-forced changes and we had a great time! Everyone was out on the dance floor dancing the night away and it occurred to me everyone there was friends or family of the newlyweds. No other labels needed. Just friends celebrating a very happy event. "​Everyone was out on the dance floor dancing the night away and it occurred to me everyone there was friends or family of the newlyweds. No other labels needed. Just friends celebrating a very happy event." ​What is your favorite community event to attend? Mull of Kintyre or any other bagpipe tune makes me think of Corbin. I’m grateful Terry and Patrick have eclectic tastes in music because I haven’t gotten any complaints about my pop & rock playlist on my iPod! ​What are some of your favorite activities to do with community members? ​I enjoy working with John. He’s good at making development calls for us and I enjoy him as a colleague. He’s been considerate asking about my kids and we can commiserate about health issues we have going on. I look forward to my Tuesday morning pop-ins at the house to get a chance to talk with Lis and Corbin or anyone else who may be around. Patrick and I have begun talking about movies. We haven’t done it yet, but I look forward to having a drawing session with Terry. What is one lesson you've learned in your time with L’Arche? How do I pick one?! Working for a nonprofit whose mission is to make life better for people is way better than my previous job working for a major corporation whose number one goal is to make a profit and provide dividends to its investors. Earlier in my work life I questioned if what I was doing was helping people. It’s nice to feel my work does indeed do something good for people. Rita, thank you for your heart for L'Arche Atlanta and our community! Your work certainly does help many people, and we are grateful! Kirsti and Rowland come to dinner monthly at the L'Arche house and develop friendships with Core Members and assistants. As a little girl, Kirsti was heavily impacted by the rejection her younger sister experienced as a child with Down syndrome. This painful reality ignited a desire to advocate for those with intellectual disabilities. She spent her undergraduate years researching society's attitudes towards individuals with intellectual disabilities and the most effective advocacy strategy to address the issue. As a result of her research, Kirsti produced a transformational documentary and established People Like Us, a nonprofit helping other cities start arts programs for people with developmental disabilities. A year ago, Kirsti contacted Tim to ask about the best way to get involved with L'Arche. She had dinner at the house one evening last November and has been coming to the house monthly ever since to cook dinner for the house and get to know the Core Members and assistants. This week, we asked Kirsti some questions about her experience getting involved with L'Arche. While in college I was moved by the few excerpts I read from Henri Nowen. When I moved to Atlanta and found out there was a L’Arche community, I knew I wanted to check it out and meet the crew that was involved. Tim grabbed coffee with a friend and I, listened to our hearts, and shared his. We loved our time when we came over for dinner, so it was an easy decision to choose to cook once a month just so I could hang with everyone again and again. What is one of your silliest/happiest L'Arche memories? My sister has Down syndrome, but L’Arche was one of my (now) fiancee’s close experiences with people who has developmental disabilities. Throughout dating, L’Arche was a super special place for me to introduce him to a group of my friends I love to be with that he hadn’t gotten to know closely yet. I can’t single out the single happiest memory at L’Arche, but I’m sure it has to do with John making a comment after something Patrick said or one of the guys poking fun at my fiancé. Kirsti says, "I really love Becca. Getting to see her each month has been a highlight for me, because I so enjoy her peaceful presence and kind heart. She encourages and inspires me to keep on at my work for people with disabilities by the way she chooses to love and serve her community." Banter around the table or hear their hearts express themselves during prayer. I also just really love Becca. Getting to see her each month has been a highlight for me, because I so enjoy her peaceful presence and kind heart. She encourages and inspires me to keep on at my work for people with disabilities by the way she chooses to love and serve her community. Being amidst and living alongside is what matters. When I asked Tim how I could volunteer, I was surprised that he said the best thing I could do was hang out at the house. I thought doing would be more efficient (or perhaps validate me more as a person), but it’s in the sitting with that community is experienced, and for those countless opportunities, I’ve been so thankful. Kirsti, thank you for sitting and bantering with the L'Arche community! We are so grateful for your friendship. Tony moved into the L'Arche Atlanta community in June 2015, and became our house coordinator in April 2017. (You can read his full bio here on our staff page.) As our longest standing house resident, he has lots of fun memories to share, and so it was a joy to interview him this week for our series! Community & Growth. I visited the community in Chicago, then Atlanta. I wanted to go where the need was greater, and I also factored in what was more outside my comfort zone. I moved in to L'Arche Atlanta June 2015. I remember initially learning about L'Arche and thinking, "this sounds like good practice for having a family," and much of that has proven true, especially in the area of home economics! The first time I took John and Terry to the pool. It had been a difficult week, but once John got in the water, he came alive! He made a lot of noise, splashed water everywhere -- his positive energy was contagious. That moment was such a high point. Shae, a previous live-in assistant, and I, decided to take John to pick up Patrick and then go to Stone Mountain Park to have a picnic for dinner. While having dinner outside, I started sneezing a lot. John thought it was hilarious, laughing up a storm and clapping. There are so many memories with basketball! We had a house night where some neighborhood kids wanted to play, so we had two teams, with most of us playing, and Terry and Patrick really got into it! I went through a particularly difficult season my first year in community. After a challenging moment, Patrick came up and gently hugged me for a few minutes, saying, "it's okay." Another time, when it was just me and the Core Members, I had a challenging phone call right before dinner. John heard to conversation and afterwards said, "So you told someone how you felt? I'm proud of you." "I had a challenging phone call right before dinner. John heard to conversation and afterwards said, 'So you told someone how you felt? I'm proud of you.'" ​What has been your favorite community event to attend? My favorite was probably a trivia night, hosted by Christ the King men's group. Patrick really shines at trivia! The men's group also provided different kinds of BBQ -- they've done this a couple of times for our group and it's always been really good. The Valentine's Dance is always a blast -- most of us love to dance! It's not really a community event, but the Mobile Marathon is always a fun time, when different L'Arche communities come together for a few days in January for our regional gathering. A silly memory was the first year I went to Mobile in 2016: after the Marathon race and fun run, Patrick, Steve (former assistant through Episcopal Service Corps), and I had some free time. Steve really wanted to go for a swim, but we only had about three hours, so we drove for about an hour, found a spot of chilly water on the beach, and he jumped in! I asked how it was, and to quote our own John, Steve said, "Refreshing!" Any AC/DC song makes me think of Terry. He loves them and he got to see them live back in 2016! I don't think I can hear bagpipes without thinking of Corbin. If I hear any 60's song, Patrick will come to mind. There are a plethora of songs that remind me of John, especially "What Child is This," "I Need a Hero," and many wrestlers' theme songs! "'Yellow Submarine' will never be the same, as early on in L'Arche I heard Jessica, the original House Coordinator, sing it as, 'We all live in a L'Arche community, a L'Arche community, a L'Arche community.'" Going to the Y to lift weights with Terry and Patrick; it's always impressive what they can do. Having jam sessions with Corbin, he really loves practicing different music. Quoting movie lines with Patrick, I don't know if anyone knows more movie quotes than him. Smack talking in a loving way with John, much in the same way wrestlers speak to one another. With other assistants, going for walks and playing late night Bananagrams. As a community, dinners together can be so special, and trying new recipes has been really enjoyable. Also, just hanging out in the living room, or on the porch! Growth takes time, not just as a community, but for each of us. It's okay to take your time, talk slow, and be patient with yourself. I have a tendency to feel the need to rush, especially when considering everyone's time. It's okay to make mistakes, that's a part of being human -- I've been steadily shedding my perfectionist brain! Daniel goes to church at Trinity Anglican Mission, where several of our house members attend, and he reached out to us about becoming friends with the community. Now he comes to the house for dinner and does other activities (like seeing new Jurassic Park World movie in the theaters) with the house. We're grateful for his friendship and grateful he let us interview him! I heard about it through the church I attend, Trinity Anglican. I realized my life was too focused on productivity, and I needed to find a place to serve and to be able to just focus on relationships. I wanted to get involved because I felt I could make new friends at L’Arche. What is one of the silliest or happiest L'Arche memories? After one of our dinners, we went into and prayer and singing. During the song, while the words of how God loves us were sung, John pointed to himself. His confidence in God’s love for him encouraged me and brought us laughter. L'Arche is all about forming mutually transformative relationships. Can you share a time when you've experienced/witnessed true friendship while in community? While I’m still relatively in the early stages of forming relationships with everyone at L’Arche, I’ve been touched by how warm and hospitable everyone has been. I have genuinely enjoyed everyone’s conversation and company. I enjoyed the Valentines Dance because it was great to see everyone dancing! You get to see a different side of people, and I find that refreshing. I just enjoy having dinner and talking with everyone. L’Arche does two things for me: it helps me focus on relationships and it helps me to slow down. I feel I’ve benefited more from L’Arche than the other way around. L’Arche has been good for my soul as it helps me understand the unique qualities in each person. ​ Daniel, we are grateful for your friendship! Thank you for investing in relationships with our Core Members and house assistants! Mark is a seminary student at Emory University's Candler School of Theology and is currently an intern with L'Arche Atlanta for his Contextual Education program. However, this summer he was a fulltime assistant in the home, sharing fully in community life with our Core Members and other assistants. Enjoy reading his interview about his experience with L'Arche Atlanta this summer! I first heard about L’Arche while taking a class at Candler on the Gospel of John with Dr. David Ford. Throughout our time together, Dr. Ford continuously brought up L’Arche as an example of the creative potential of the Spirit in forming beloved communities within the world. Then, in my Church and Community Development course, Dr. David Jenkins brought up his involvement with the L’Arche community, and began citing it as a group who really does community well. Around this time I began brainstorming communities where I could get involved for the purpose of my Contextual Education II internship (a requirement for the MDiv program at Candler) and the fateful day finally came where I reached out to Megan and Tim at L’Arche. The rest is (recent) history. What is one of your silliest L'Arche memories? At the risk of telling a “had to be there” story, this is one of the silliest memories I have from L’Arche: There was a night where everyone was relaxing in the living room, setting up for dinner when Terry came inside from getting the mail. Terry had a certain energy about him that I had not yet experienced and he began telling a wild story, something about an encounter with an “old lady in the bushes eating berries.” Everyone had a quick laugh about it but Terry did not let it end there; he continued motioning for someone to come outside and see. Another staff member went with him and came back moments later to confirm that there really was an elderly woman out in our yard picking berries and eating them! Terry’s blend of excitement and confusion over the matter was suddenly shared by everyone and the oddity of it all hit me so hard that I couldn’t contain my own laughter. What is one of your happiest L'Arche memories? Over the summer, Patrick goes to Lucky Shoals Park to play basketball in the mornings before his days at work. One day we were about done shooting baskets when two young brothers, maybe 4 or 5 years old, shyly wandered over to us. After a bit of prompting, they finally revealed that they wished to play a game of two-on-two with Patrick and me. I quickly told them that we had to leave to get Patrick to work on time, but that we would have loved to if we had enough time. The next day, Patrick and I were at Lucky Shoals again when I saw a van pull up to the court. A door slid open and the boys came charging out. They ran straight up to us, huffing and puffing as they now asked with a new found confidence if we were ready to play. I turned to Patrick, feeling quite anxious as he had not seemed too enthused about the boys’ request the previous day. To my surprise, Patrick not only agreed to play, but even used their kickball during the game because the basketball was too heavy for them to throw up to the hoop. (For reference, Patrick does not care much for the mixing and matching of sports’ balls with different sports and had corrected me multiple times already for kicking the basketball around the court because, “We are not playing soccer!”) Patrick and I split up to make things fair for the brothers, and we played for about 15 minutes before their Mom called them away while thanking us profusely for our time. 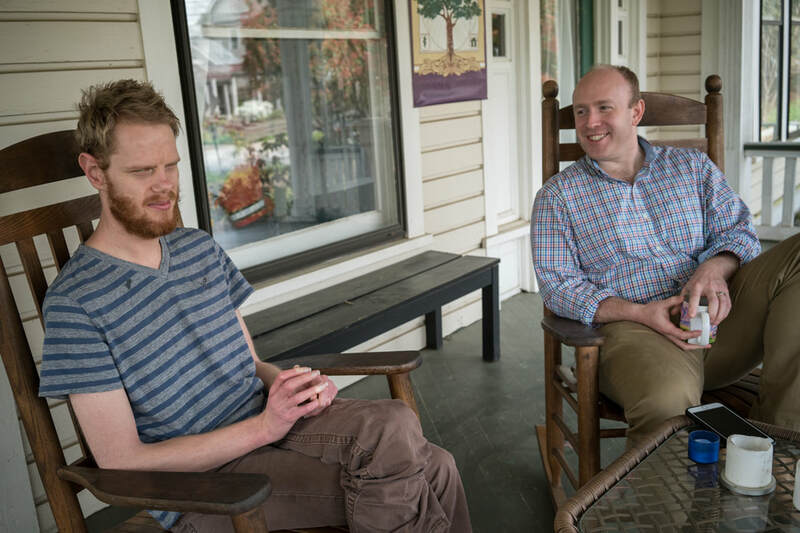 What struck me about our time with the brothers was not just Patrick’s willingness to venture into the unknown, but the gentle and warm way in which he did it. He was complimenting his teammate and giving him high fives throughout the game, and it was clear that the brothers were impacted by his welcoming them into his time and space, not to mention how impressed they were with his strength in hurling that ball around! L'Arche is all about forming mutually transformative relationships. Can you share a time when you've experienced or witnessed true friendship while in community? We were having a party to celebrate Terry and John's six year anniversary as founding Core Members for L’Arche Atlanta. After receiving a communal anointing with water and love, they were both given a chance to share about their six years together in the community. There was something in the way they glanced at each other, passing the “stage” back and forth, and in the way Terry motioned for silence so that everyone would pay attention to John while John spoke, that revealed an profound love for one another. From an outsider’s perspective, it is easy to see the Core Members as nothing more than roommates occupying a shared space, but in this moment it was clear to me why they refer to each other as brothers and family. I earnestly seek to emulate the desire I saw in that moment, a selfless desire for someone else to be both seen and heard before a community of love. "Layla" by Eric Clapton. There’s some nostalgia here from childhood road trips, laying in the backseat while my dad listened to Clapton’s “Unplugged” album as we drove through the night. I have been on and off Clapton for a while now, a habit too hard to permanently break, but it brought a lot of joy back when I heard Layla sounding out from John’s room one day. Now, if I ever catch John sitting by himself in the computer room, engaged in serious reflection, as he is prone to do, I will try and sneak over to the computer and get some Clapton going. There is nothing more electrifying than a dancing John Hudson! From an outsider’s perspective, it is easy to see the Core Members as nothing more than roommates occupying a shared space, but in this moment it was clear to me why they refer to each other as brothers and family. I earnestly seek to emulate the desire I saw in that moment, a selfless desire for someone else to be both seen and heard before a community of love. I have just finished a set bench pressing and stand up. Sitting and listening to music with Corbin. I have had some intense yet serene moments when the house is quiet and Corbin comes out to the living room to listen to music. We sit in relative silence and really get lost in the lyrics, the rhythm, and the instruments. This summer at L’Arche I gained insight into how my mindset quite literally shapes each moment of my day. Interaction after interaction within the community led me down a path of never ending self-reflection on the part I played within the whole community and my ability to connect with each of its members. As the summer flew by, I gradually awakened to the reality that it was not the content of any given day, good or bad, that created in me the sense of a “good day” or “bad day” at the house. Instead, I realized that my judgments on the quality of a day were based in the mindset I had approached that day with, and in my ability to sustain (or shift) that mindset throughout. The Core Members have developed daily and weekly routines in which they are comfortable, productive, and engaged, as have the other community members, and there is a natural rhythm to the L’Arche Atlanta community. Rhythms are great, but with any repetitive practice comes the looming threat of monotony, and as the weeks went by, my growing comfort with the weekly routines transformed my excitement and expectation into presumptions about what the days would hold. This calculating mindset doesn’t exactly thrive in community and I quickly realized that it not only made the days longer and harder for myself, but it also deprived me of the ability to embrace one of L’Arche’s greatest communal gifts: surprise! 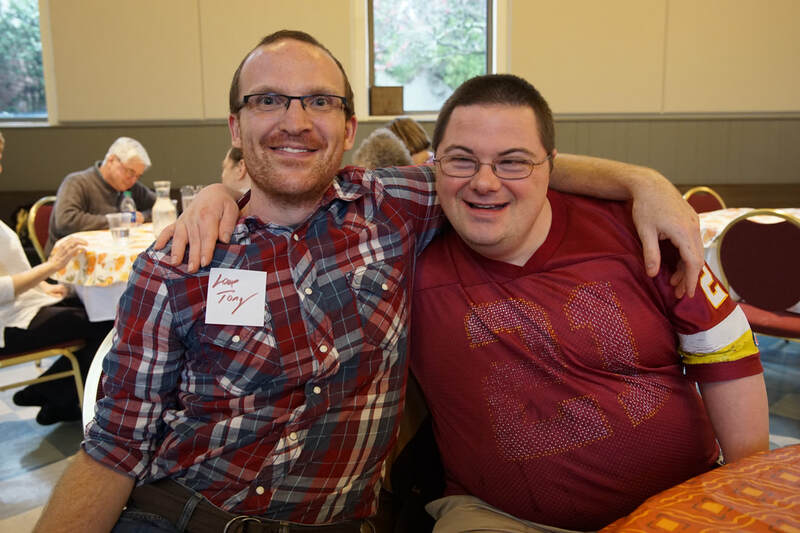 Mark, we are thankful that we get to keep you as an intern this year, while you learn about faith within the L'Arche community, and our community benefits from you leading us in faith formation exercises! 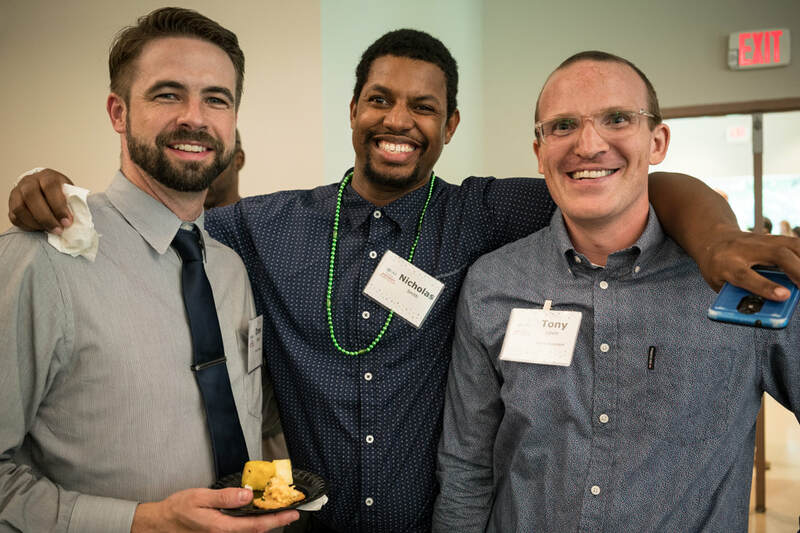 As we head into our Birthday Benefit & Bash this weekend, who better to hear from than L'Arche Atlanta's executive director, Tim Moore? Tim joined L’Arche Atlanta as one of the founding assistants in August 2012 where he brought his experience in two previous L’Arche communities to help give shape to the new rhythms of community life in Atlanta. After a year in the role of associate director of development, Tim was named the executive director & community leader in June 2014. 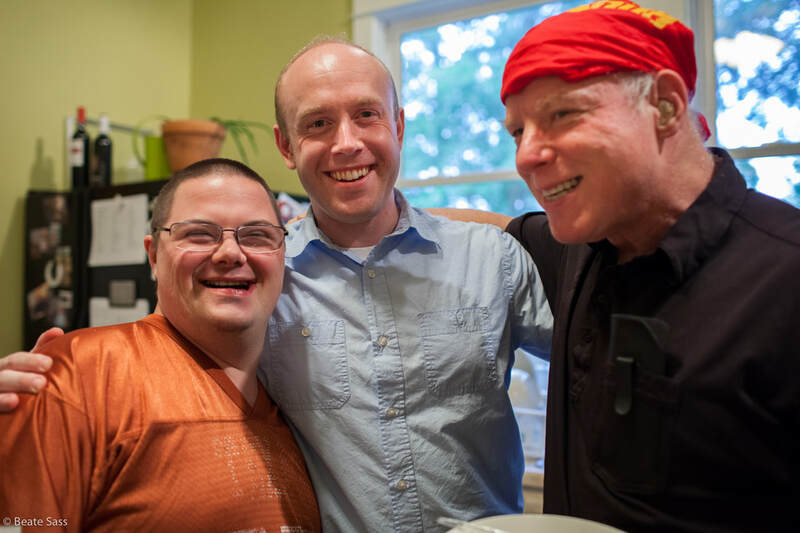 Tim truly lives out the mission of L'Arche, calling the Core Members his true friends -- to the extent that when he got married last fall, he asked John, one of our Core Members, to be his best man. Enjoy reading his interview! Henri Nouwen was my introduction to L’Arche. I read Adam and In the Name of Jesus in college and was drawn to the idea of an intentional community centered on vulnerability. I had several friends with disabilities growing up and the thought of sharing community life with people like them made me smile. In L’Arche New Zealand, we did a public performance of the Noah’s ark story for one of the community’s anniversary celebrations. We each dressed up and painted our face as one of the animals on the arc. I was a baboon with one of the Core Members and we entered the part quite convincingly with hoots and jumps and giggles. Every time John Hudson asks me, "You alright, Tim?" He’s so unbelievably intuitive and knows when to ask the right question with the right tone. I feel known, seen, and held in those moments. Likewise, I’d like to think that our friendship has shaped him and helped him to discover and claim new gifts and inner strength to live his life more fully. "John is so unbelievably intuitive and knows when to ask the right question with the right tone. I feel known, seen, and held in those moments." I love the Valentine’s Dances! But I also really love our All Saints event. Grief is such a powerful and important part of being human and I don’t think our culture enables healthy grief experiences. I’m touched every year by the tenderness and power of this annual practice and I think it helps us to see and hold each other in community better. Sharing a meal together. Praying together. Singing together. Growth is not linear! The real is often in the messy. And a core member’s laugh might just be the song of an angel. Thank you, Tim, for your leadership and passion for L'Arche! We're celebrating our birthday all month long, and who better to interview to hear our "birth story" than our founding community leader? After being involved with L'Arche in France for 15 years, Curt (an Atlanta native), his wife, and their four children (ages 2-9 when they arrived), moved to Atlanta in September 2009 to launch the L'Arche Atlanta community. Curt and his family worked alongside the founding L'Arche Atlanta board to launch the L'Arche house and surrounding community. This week we got to interview Curt about his time here. I first heard about L’Arche from my friend Grace. I needed languages for graduate school and wanted to go to France and learn French--I thought perhaps I would pick grapes. Grace suggested that L’Arche would be a place that I would enjoy, and that I could reach out to a community in Northern France in the town of Compiegne, where her brother and sister were assistants. I didn’t know much about it. I found a Henri Nouwen book before I left and read it on the airplane on the way there. When I got to L’Arche, I was really struck by the genuine friendships I experienced and the beauty of the people in my home. I had never laughed so much in my life, as I did there daily. We could be ourselves. We also learned to work through differences and conflict. We shopped and cooked together, worked together, prayed together. I was growing, and I was very happy. I also saw how important it was: how Jasmine and Benoit [two Core Members in the home] wouldn’t have the opportunity to have a life like this if people did not make a commitment to live in community with them, as they had there. What made you decide to become involved with the building of the L’Arche Atlanta community? In 2009, I had been at L’Arche, in France, for about 15 years. I’m from Atlanta. My father was ill, our children were young, and Anne-Christine and I thought that coming to the U.S. “for a year or two” [they ended up staying five years, until 2014!] would be worth exploring. L’Arche Atlanta had just become an official project of L’Arche USA, due to lots of great work by the founding board, and the community needed a founding community leader. At first it seemed like way too big a project for our family to invest in--too much time, too much energy. But the more Anne-Christine and I thought about it, the more it just seemed right. It connected with our deep aspirations, and our faith, to be part of building a community that would change lives, honor people with disabilities, bring together people across differences and create the “L’Arche magic”--which is such an important vision of the human family, in our view. And we thought it would be fun. We knew it would be good, but we had no idea that it would be as joyful and as beautiful as it was. Curt's daughters, Caroline (9) and Elisabeth (4), helped with cleaning up the Mead Road house before the first L'Arche residents moved in. This picture of Curt from 2012 is still on the house refrigerator today! ​Can you share a memory or two from the early days of L’Arche Atlanta? When you asked this, memories just came flooding into my mind and heart. Where to begin? Mostly what I remember is people – so many people involved in building this project. If I could highlight a few memories, I would first say the general memory of the powerful, deep commitment of the founding board. I’d love to talk about so many people: Laura, Judy, Chuck, Betty, Isaac, Lee Ann, Bobby, Austin, Toni, and so many others. I was very moved by the concrete acts of love and dedication this group showed. The human heart is so powerful, so beautiful. This early, often hidden, very loving work, is a huge part of the root system of L’Arche Atlanta. Laura and Talley Wells provided amazing leadership in L’Arche’s development. "I remember the powerful, deep commitment of the founding board....I was very moved by the concrete acts of love and dedication this group showed...This early, often hidden, very loving work, is a huge part of the root system of L’Arche Atlanta.​"
I also think of the Community of Hospitality—Ann, Lisa, Britt, Brad, Rachel, Jerry, John and so many others—offering to take a decisive role in helping begin L’Arche. L’Arche was new, and this group of people who had built community, worked for justice, and prayed together over decades both offered for L’Arche to begin in a house where they had begun their own community, and they rooted this project in experience, relationships, and wisdom. There were the people who came to the community events each month—some occasionally, and many each month. This group was the backbone of creating L’Arche’s energy and communion in Atlanta. And the growing community of supporters, friends of all kinds. And there was the founding team of the house: Jessica, Tim, Sara, John, Lara, Terry, later Patrick. I could talk for a week and still not do this justice. As I said, so many people come to mind, and so many more than I can name. Jessica and John hang out in the L'Arche living room, in 2012. Patrick's first week in the house (2013). Many people attended the first L'Arche Atlanta community event in 2010. L'Arche is all about forming mutually transformative relationships. Can you share a time when you've experienced or witnessed true friendship within the community? Yeah, it’s a funny memory, because it seems so simple. One evening we had had one of the first big dinners with friends at the L’Arche house and we had borrowed folding tables from Oakhurst Baptist. I asked Terry if he would help me take them back. He did, but it wasn’t really him helping me: he immediately took a kind of gentle leadership. Terry is really responsible and he did this with seriousness and reliability and a grounding presence. It was a sign of friendship, being together doing ordinary things. Something about moving those tables that night and the way Terry and I communicated with very little words, reminded me of my father, or my brother. It made me happy. I was aware of a bond, a gratitude, a sense of well-being within me. I felt at home. I think he did, too. What was your favorite community event to attend? What has been the most surprising thing about the community as you’ve seen it grow? Getting to see what can happen as so many different people say “yes” to building something meaningful together. L’Arche Atlanta is the fruit of a contribution of so many different people giving very different gifts. It’s a beautiful metaphor for the world, don’t you think? That what each of us has to give is enough – and that when we put it all together it’s true beauty. How has your involvement with the forming of L’Arche Atlanta remained with you? What has been the lasting impact? I’m not sure I’ll ever finish unpacking that. What can I say? That we can build change together, a human family that makes sense. That love happens. That Terry, John, Patrick and so many others can be leaders in leading us to this. Curt, we are grateful for you and all you did to make L'Arche Atlanta a home for so many! Thank you! Liz & Joe enjoying a laugh at the L'Arche house. 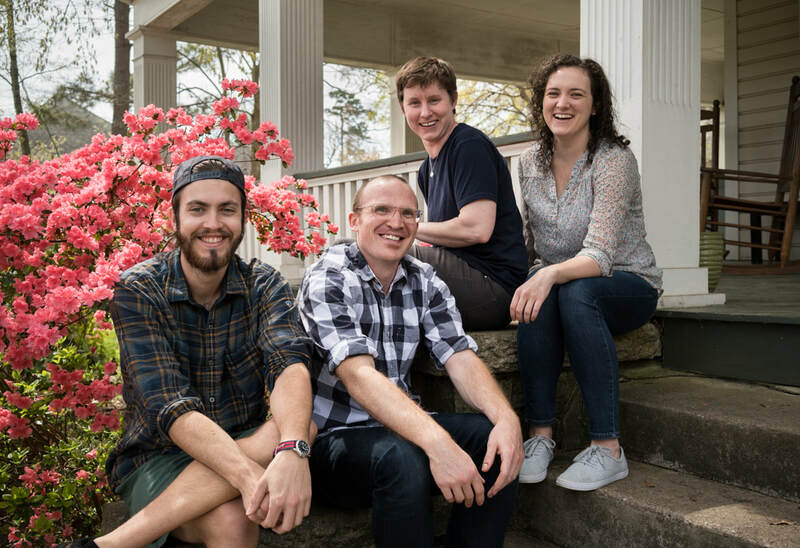 During our birthday month, we are interviewing people that have been with L'Arche Atlanta all six years and Joe & Liz fit that description, plus some! Joe & Liz are faithful friends to the community, coming every Monday night for dinner, plus for celebrations, community events, and whenever there are special times for our community or our Core Members. They are truly our friends and we are so grateful to have them as part of our community! This week we got to interview them: in the interview below "I" refers to Joe but most responses apply to both of them. What made you decide to become involved in the community at its offset? I think what first got us started looking into L'Arche might have been from an article by Dorothy Day where she mentioned Jean Vanier [the founder of L'Arche] as a real inspiration of hers. Someone who inspired Dorothy Day is worth taking seriously! So I took it seriously and I began reading what Jean had to say. I remember being very touched by his thoughts about our shared humanity, but kind of perplexed on why people would form intentional communities of people with and without disabilities. We visited the L’Arche community in Cork, Ireland and thought, "Gee, what a shame, we'll never have one of these near where we live." Then we stumbled on some mention online that a L'Arche community was about to open within walking distance of our house. That seemed like more than coincidence to us! The guy who really made L'Arche make sense to me was the first community leader, Curt Armstrong. Curt is a gem and a model of patience and giving — he really exemplified to me the sort of person that a life in L'Arche can help create. I can't remember how many times we got together at Dr. Bombay's for coffee and chats. Through Curt, I came to see that, whatever else L'Arche might represent, at it's core, it's a caring and supportive community that makes us all better people. That's exactly what I was looking for and really wasn't finding in places more into "community service" and doing something for people instead of with people. "I came to see that, whatever else L'Arche might represent, at it's core, it's a caring and supportive community that makes us all better people. That's exactly what I was looking for and really wasn't finding in places more into "community service" and doing something for people instead of with people." There is never a dull moment at the L'Arche house when Joe & Liz are around! ​For those of us that are new to L'Arche Atlanta, can you share a memory from the early days? Liz and I helped out with getting the house in shape for opening. We painted John's room and did some carpentry work in Patrick's that was well-meaning but that the real carpenter had to re-do. We put the legs on those weird blue chairs in the front room, and wrestled with IKEA furniture that just wouldn't come together after hours of trying. We remember the excitement of having Patrick join the group, and then Corbin. 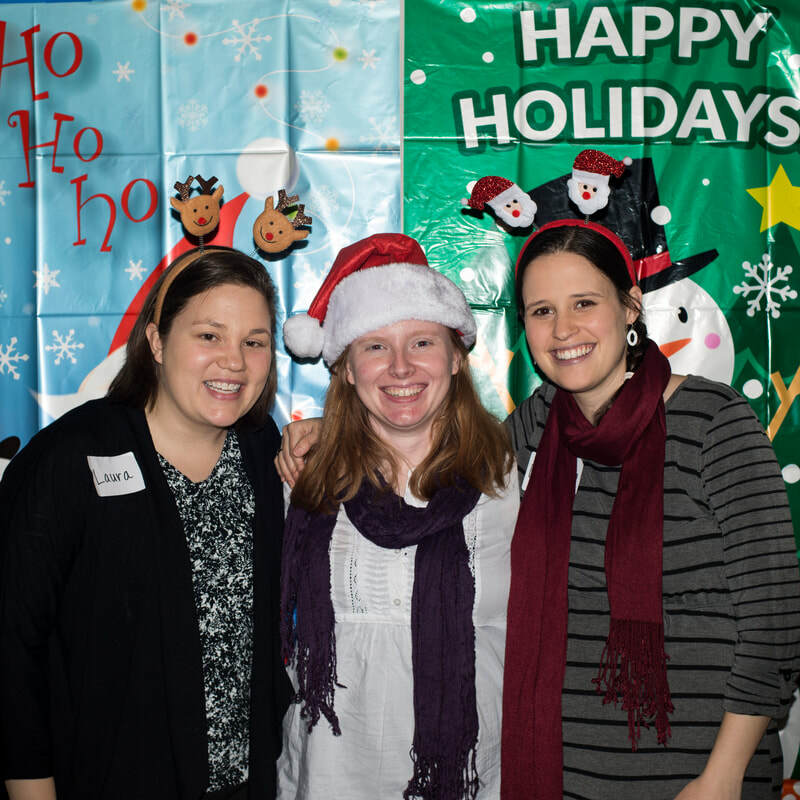 We have known and loved every assistant who has been a part of L'Arche Atlanta from the beginning. The community has grown and evolved, and we have grown with it. It's hard to imagine there was a time when it was not part of our lives, and it still surprises us to think that it's only six years old. We have learned that presence is the greatest gift people have to give each other, and that the key to being truly present to another person is to have a different conception of time. You can't rush presence, and you can't allow haste from the other areas of your life to intrude on your time with people to whom you are trying to be present. When all is said and done, we don't do anything for L'Arche Atlanta except show up and listen. People who want to be friends of the community might wonder what they have to offer, or whether they need special skills or what kinds of problems they might be able to help solve. And in fact those are not the things to be concerned with. We both have a background in special education, but when we're at the house, nothing is further from our minds, and that skill set is not relevant to the kinds of relationships L'Arche fosters. The only skill you really need as a friend of the community is the skill to slow down and show up. "When all is said and done, we don't do anything for L'Arche Atlanta except show up and listen. People who want to be friends of the community might wonder what they have to offer, or whether they need special skills or what kinds of problems they might be able to help solve. And in fact those are not the things to be concerned with. The only skill you really need as a friend of the community is the skill to slow down and show up." Patrick & Joe hang out in Mobile during the regional gathering -- a moment when no one had to worry if the power was on! ​Music is a big part of our household. Is there a song that makes you think of L'Arche or a specific person in the community? To us, the sound of bagpipes is the sound of Corbin, and anything from the 50s now immediately leads to thoughts of Patrick, and AC/DC means Terry. For John, it's Christmas music and "This Is the Day." Tell us one or two of your most treasured L'Arche memories. At one point during the regional gathering this past January in Mobile, the electricity went out. Instead of flipping out, people just rolled with it like the totally unexpected is the only normal thing in the world. They took out their phones, turned on the flashlights, and sang "This Little Light of Mine." Such a L'Arche moment. Another treasured memory was at La Forestière, a L'Arche House in Trosly where some of the people with the most involved physical disabilities live. (It's where the amazing scene in "Summer in the Forest" was shot of Jean sitting and very quietly telling a silent core member, "Tu es beau, tu sais, you are beautiful, you know.") All of the folks there have feeding concerns, so dinner is pureed. But as a special L'Arche welcome, they gave me boiled potato, celery, and carrot un-pureed. It was a beautiful way to honor a guest. Joe & Liz, thank you for choosing to be a part of the L'Arche Atlanta community! During our birthday month, we wanted to feature someone who has been with our community since the beginning -- all six years, plus some! Laura has been a consistent and dear friend to everyone in the L'Arche house. Since 2012, Laura has had dinner at the house (almost) every Friday night. In addition, Laura volunteers on the community events committee, helping to create inclusive celebrations where all can find a place of fun and belonging. This week Laura answered some questions for us about her L'Arche experience. How did you first hear about L'Arche? What made you decide to become involved with the community at its offset? I first learned about L'Arche through JustFaith, a program that explores Catholic social teaching, and L'Arche was featured at one point. Being a part of the program happened to coincide with the construction of the house on Mead Road, and somehow I found out that volunteers were needed to paint and help fix up the house. I volunteered a few Saturdays painting a bedroom and bathroom downstairs, part of the living room/dining room, and part of the upstairs loft. I felt an immediate connection and comradery with the other volunteers and decided that L'Arche was something that I wanted to continue to be involved with. I emailed Curt [the Community Leader at the time] and asked how to get involved once the community opened, and he encouraged me to come to dinner once a week. I didn't really understand how coming dinner would be helpful to the community. I was expecting to sign up to help with chores or do yardwork. His offer seems to benefit me more than the community. But what has evolved over the past six years has been deep friendships filled with joy and care instead of relationships built on handouts or hierarchy. My happiest L'Arche memory is celebrating my birthday/anniversary and getting to be part of the birthday celebrations of other people. The sharing of gifts at the birthday celebrations is my favorite. [The sharing of gifts is when everyone in the room tells the celebrant a gift they see in them or something they appreciate about them.] I enjoy getting to think about how a person has impacted me over the course of a year and sharing their giftedness. It's also a really beautiful and moving experience to sit in the 'hot seat' and hear about the gifts that you bring to the community. We all have people in our lives that we love and cherish, but L'Arche gives us the opportunity to share those expressions of love at least once a year. It's something I wish the world was more deliberate about. When I first started coming to the house, I was probably closest with Terry. We had a great time doing things together like playing football or walking around the neighborhood. John and I developed a friendship more gradually. For the first two years we would talk about wrestling or the shows that he was recording. Then, John started calling me his "real friend". I'm not sure where this phrase came from or how long John has been calling me his real friend, but it's true. About two year ago, I was packing up to leave the house, and on my way out the door, John called out "I love you!" It came from such an honest and heartfelt place, and it was so true! It was so refreshing to have someone express their feelings without expectation of reciprocation or any hint of baggage. John taught me to be more open to people in my life so that I am willing to share how I feel and receive the love others want to share with me. "On my way out the door, John called out "I love you!" It came from such an honest and heartfelt place, and it was so true! It was so refreshing to have someone express their feelings without expectation of reciprocation or any hint of baggage." ​​What has been your favorite community event to attend? My favorite community is hands down the Valentine's dance. I love that everyone is willing to get out on the dance floor and be silly and have fun for an evening. It doesn't matter if you are talented at dancing or not. I look forward to it every year. It's probably my favorite day of the whole year. "Wobble Baby"! About two years ago, Terry was in a bad mood and not having a great night. I put on that song to dance to, and his whole attitude turned around. We ended up having a great evening. When that song came on at Sarah's wedding, everyone got on the dance floor! I really enjoy spending time with the core members after dinner. The activities have varied over the years: UNO games, art, walks around the neighborhood, basketball at the park, WWE wrestling on TV. That time hanging out after dinner feels really sacred. It's a wonderful chance to have some one on one time with a core member and catch up. I think the most important lesson I've learned at L'Arche is to be present to where you are and who you are with. Frequently, individuals with intellectual disabilities have a tremendous gift of time to offer. By slowing down, putting aside my to-do list, and being present, I am able to accept that gift. If I am not able to be present to my time in the community, I am essentially throwing away that beautiful gift. That would be such a shame! Thank you, Laura, for all the joy and love your bring to our community! We love you and you really are our real friend! John is one of the founding L'Arche Atlanta Core Members -- he joined the L'Arche house in August 2012. John brings the gifts of friendship, conversation, and caring to our community. He's got a huge heart for others and for L'Arche. John also works in our development office, making phone calls and sending emails to thank donors. This week we got to sit down with him to interview him about his L'Arche experience. I first heard about L’Arche from Curt Armstrong. I went to a community event and met Tim, Jessica, and Sara [the founding house assistants]. Then I moved in August 27, 2012. I moved in here because this is the place I wanted to be. With L’Arche I have opportunities to go more places and the ability to try new things. Playing and joking around with my housemates. I also liked the time we went bowling together right after I moved in. I’d like to do that again sometime. Everybody was having too much fun. One time the L’Arche Jacksonville community visited and we all went bowling together. I am friends with the people who come to dinner. Michelle comes over on Tuesdays and I like getting to know her. When I first met Tim, I didn’t know him. We started to build a friendship when I came to visit the house right before I moved in. There was one morning when Tim was on morning routine and I squeezed so much toothpaste on my toothbrush. Tim still likes to talk about my “toothpaste party!” It was everywhere! Laura comes over on Fridays and I call her my “real friend.” When we first met, I didn’t speak to her. I just walked away to my room. That day, I wasn’t very interested in Laura. We started to have a real friendship after that. She kept coming back for dinner and we got to know each other better. I met Terry and his sister before I lived at L’Arche. He stayed at my old host home for a little while and we started to become friends. One day we were doing yard work and I could tell Terry was a hard worker. I still see that now! He’s a hard worker and we go waaaay back. I love Terry and he loves me. We have a long friendship history. The birthday bash! And the Valentine’s Day Dance -- this year my girlfriend and I were the first ones on the dance floor! I also love the talent show. This year I did a magic act with Laura and I sang a song. I like to go to the Y, where I sometimes go swimming and lift weights. I like to walk down to the Oakhurst Village: Kavarna and the Oakhurst Market are my favorites! John, thank you for the awesome presence you are in our community! We love you! This week, we interviewed Bobby! Bobby was a L'Arche Atlanta board member for several years, but now dedicates his time at L'Arche to being a friend to our community. He faithfully spends Tuesday evenings with one of our Core Members, Terry, who does not have family nearby. We asked him a few questions about his experience at L'Arche Atlanta. I first became familiar with L'Arche through the writings of Henri Nouwen. When Friends of L'Arche Atlanta was forming, I learned about it through my long-time friends Paul Duda and Shannon Powell. I served for a couple of years on the board. Since 2013, I have been a volunteer, spending Tuesday nights in the community. My closest friendship is with core member Terry. To paraphrase Nouwen, “It is I, not Terry, who gets the main benefit from our friendship.” I believe, as Nouwen said, that God reveals himself through the reality of disability. If you want to see God’s face and understand God’s nature, there is no better way than to spend time with people with intellectual disabilities. "When I pray, there’s often doubt, unbelief, expectation, fear, shame, and baggage involved. Terry talks to God like he talks to me. His faith is so real that he doesn’t think it is any more strange to share the joy of football with his heavenly father than with a friend. In that picture I saw the most intimate, genuine relationship with God I have ever seen." ​L'Arche is all about forming mutually transformative relationships. Can you share a time when you've experienced or witnessed true friendship while in community? I’ve seen the core members argue with one another and get mad at one another. But I have also seen them love one another fiercely and describe one another as best friends in the world. I see the truest friendship displayed every time there is a gathering in which we call out the gifts of a member of the community. There’s nothing like thinking about and expressing what you specifically value and appreciate in a friend to transform a relationship. My favorite community event is the annual auction. It’s so festive, and brings together a wider circle of people to celebrate the members of the L'Arche community and celebrate God's love. I could never hear “This is the Day that the Lord Has Made” or “Kumbaya,” without thinking of L'Arche. While these songs are from my childhood, the L'Arche community also sings them whenever we pray together. They have taken on special meaning over the years of my involvement with L'Arche. A couple of years ago, I had the privilege of traveling with L'Arche Atlanta to Mobile, AL for the First Light Marathon. I met members of L'Arche communities from the Southeast all the way to Kansas, and places in between. It opened my eyes to the fact that the same amazing L'Arche community I experience is transforming lives all over the country and all over the world. One of the biggest lessons I’ve learned at L'Arche is that things I worry about are mostly foolishness. Terry helps me to understand that life is a lot more straightforward and sweet than I often allow myself to think. Every single week, being with Terry and the L'Arche community helps reset my thinking in that very powerful way. Thank you, Bobby, for your friendship and presence in our community. And for allowing us to interview you! Becca joined L’Arche Atlanta as a live-in house assistant in June 2017. We asked her a few questions about her experience with L’Arche Atlanta. At the time I was still in college and had plans to spend time in the Jesuit Volunteer Corps when I graduated, but that first interaction planted a seed in my mind about L’Arche and life in community. In the spring of 2017 I found myself seeking a change in my work and my lifestyle. As I discerned my next step, my mind kept coming back to L’Arche and those beautiful relationships I had witnessed years ago. The time finally seemed right for me to experience L’Arche firsthand! There are SO many, but I think my happiest memory was of the whole community dancing at Sarah’s wedding last fall. I will never forget Terry’s face when the Wobble song came on! The rainy weather couldn’t stop our crew from being silly & dancing the night away! "Our house is often characterized by the joy and laughter that we share, but a truly transformative relationship is one that shares in pain and sorrow as well." It wasn’t an official community event, but we hosted a casual Halloween party last fall- everyone wore costumes and we had a campfire (complete with s’mores) while passing out candy to the trick-or-treaters. It was such a fun night to hang out with friends from the community! Our very creative Core Members LOVE to re-write the words to songs to be about our house. I will never be able to listen to “Mr. Sandman” or “The Brady Bunch” without hearing John’s lyrics about Terry being “very refreshing”! Music jam sessions in the car! Patrick is particularly talented when it comes to belting out Disney songs on the way to work and Terry’s car dance moves always make me laugh!